The CLYW Dune is the new monometal signature yoyo for team member Anthony Rojas. The CLYW Dune is CLYW’s first signature yoyo for team member Anthony Rojas, and it’s a noticeable departure from CLYW’s usual releases. Weighing in at 68 grams, it’s a full 2 grams heavier than most CLYW monometals and the difference in play is noticeable. The added weight makes the Dune considerably more stable, something that’s required for Anthony’s long combos, huge body moves, and big counterweight tricks. The Dune throws heavy but plays light and incredibly fast. For many people, they’ll find the Dune to be possibly the fastest playing monometal in CLYW’s line-up, and the extra weight lets it muscle through tricks that would slow down plenty of other yoyos. The Dune is definitely one of CLYW’s most powerful yoyo releases to date, and a great competition yoyo. The CLYW Dune takes a visual clue from the Pool Party Banana Hammock, and for good reason…the B-Ham was originally designed by CLYW owner Chris Mikulin as a test to see if he could design a yoyo totally blind that would work for Anthony’s play style. The final version of the Dune and B-Ham are vastly different, but the visual similarities in the profile are noticeable. The inner cup of the Dune features loads of curves and bulges, giving it a unique look. The combination of a slightly domed center with the shortened hub and the curved out details lets the Dune take heavy visual cues from actual sand dunes, which is a nice touch. Available in 6 colors to start, including Sand (shown), the first Dune release should have something for everyone. The CLYW Dune retails for $85 – $95 (depending on colorway), the same as all of CLYW’s current line-up of monometal yoyos. Not quite cheap enough to be an impulse buy, but it’s a nice splurge for a casual player and still plenty affordable for any serious competitor looking for a new contest yoyo and a few backups. For the performance the Dune seems to be worth the price, and the quality of the machining and anodizing are great. CLYW Dune is available now at YoYoExpert.com. CLYW dropped photos and specs of the Kayak, giving us our first full look at the new signature model for 2x World YoYo Champion and generally amazing yoyo player, Yuuki Spencer. The Kayak borrows from the original Chief design, which is generally considered the “flagship” yoyo of the CLYW brand, with its unique double-rim design. The body shape is classic CLYW, but the addition of a fingerspin hub definitely brings a more recent feature, something we’ve previously only seen from them in the Compass. The release date for the Kayak is February 2nd, 2017. Check out specs and more photos below! I got a chance to talk with the man behind Freshly Dirty, Alex Morton, about the beginnings, inspiration, and the new new of what to expect from this fresh new company. How did y’all get your start? So we started out last year in March taking a shot in the dark at making fixed axles, they were terrible in the beginning but we knew that we had to get something off the ground and begin building a fan base. That’s when Coffin Nachtmahr started supporting us! He actually has quite a few of those first fixed axles. After the first fixed axle design I started on the one that really got us going, which was The Traveller. Super simple in design, but with some good thought behind it and some good wood that we sourced here in Indiana. It just kept growing and we put a lot of time into the design and feel of what we wanted. At first I started alone then added my good friend Gerald Bass, everybody kept calling him ‘Lil Bass’ at worlds this year. Going to the World YoYo Contest was what really propelled us into building a team and really committing to this idea of a small yoyo company. So Coffin, helped out with major moral support? cool cool. I’ve seen the Traveller in just pics and clips from Alex Curfman. You just woke up and wanted to try it? The supportive feel at contests (especially Worlds) will do that for sure. It was my first Worlds event and I met and networked with so many people. OhYesYo is amazing, I shot and edited that grungy VHS video for them and then out of nowhere I received tons of OhYesYo guys and other throwers that want to support Freshly Dirty. At Worlds we grew into a full effort, Gerald Bass, Arthur Foley, Charlie Byers, and after worlds we didn’t even have a bearing design and I offered Alex Curfman to join the team, I was stoked when he wanted to join! Dude loves his fixies haha. Truly a great beginning story of the freshly dirty underdogs. So how about the name? What inspired you to name it all “Freshly Dirty”? Underdogs for sure, but we like where it’s going. Sticking to small run stuff right now and learning how to do this from the ground up is what we do! I would describe things as such, “Dude that jacket is so Fresh yet Dirty” “Freshly Dirty” was how I described my style/tricks Cool, but kinda dirty or sloppy. Definitely a work in progress always. Right on, I feel you. good stuff. You wanted to do fixed axels, so what got y’all to make the jump to Cardboard Dreamboat? During Worlds last year in Cleveland we started talking about doing something beyond our fixed axles. Arthur Foley goes to school at Georgia Tech and has all the CAD magic, over Skype and a lot of input from the Freshly Dirty family we started a prototype that had aspects of our favorite things in a yo-yo. It had a lot of silly names in the beginning. Left Turn, El Crusty Doro, Dust Bunny, but we all kinda just went with it and everyone liked the name of Cardboard Dreamboat. One last thing, before I let you go, got any words for the community? There will be more crazy names/colorways and content in general, also looking to expand the freshly dirty family this year. Keep it fresh, stay dirty. Gear, apparel, and future collab in the works 😉 forgot to mention that. Thanks Johnny! This beauties drop on their website January 27th at 8pm EST. It’s finally here! CLYW is releasing a new version of the yoyo that started everything for them: The Peak! The Peak 2 looks a lot like the original, but with a ton of changes. According to CLYW owner and designer Chris Mikulin “the Peak 2 is slightly wider than the original, has a rounded step in the gap, no IRG, flat rims like the Heaven Sent Creep, and oversized donuts in the hub compared to the original”. Check out the release and specs below…which color are you getting? We can’t believe it’s been TEN YEARS!! You’ve given us so much love and support over the past decade, and we had to give you something wonderful to celebrate. So here it is: the Peak 2. Fast, floaty, comfy, and so much fun! Everything you remember and love about the original but with better response and weight distribution. Available Monday, December 19th at 10 pm EST, only at CLYW.ca. This first run comes in a special 10th Anniversary stamped box. CLYW has unveiled The Gorge, a new oversized bi-metal yoyo dropping tonight (surprise!) 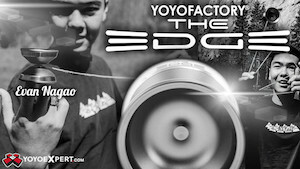 only at YoYoExpert.com. Designed by CLYW owner Chris Mikulin, the Gorge is a fat, fun, throwback yoyo meant to be a casual throw that can still hit anything you want. A blend of performance and laid-back style makes the Gorge just stupidly fun and super addictive. Once you get one of these, the chances are good it’s going to become a daily carry. Check out the CLYW description & specs below, and snag one at YoYoExpert.com tonight at 10 pm EST. The Gorge is a powerful, long-spinning throwback to the days of return top design when walls were high, profiles were round, and bi-metal designs were scarce. This is exactly the sort of return top that CLYW owner Chris Mikulin absolutely loved when he was first starting out, and now he’s created one with his own style and design sensibilities. The Gorge is an oversized return top with a round, narrow profile. It feels amazing in your hand, spins as long as you want it to, and will quickly become your new go-to throw. Monkeyfinger’s newest design, the Prime8, will be available Friday, December 9th! Check out their press release and specs below! We are excited to introduce you to our first yoyo release of 2016 that we have dubbed the Prime8. This yo-yo is the signature throw created in cooperation with MonkeyfingeR team captain Tyler Jorgensen. Utilizing a comfortable H/O-type hybrid design, it is both stable and fast. This design allows the Prime8 to perform a wide range of tricks while maintaining its momentum. Additionally, the cup design features not one but two inner thumb grind rings! As always, we at MonkeyfingeR Design pride ourselves on our cutting edge and innovative colour schemes, and we are confident that the Prime8 will not disappoint! 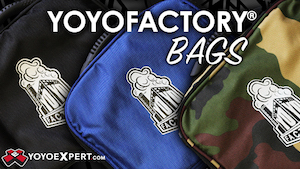 Basecamp, the ongoing collaboration between CLYW and YoYoFactory, has revealed its next release! The Sherpa replaces the Moonshine in their product line while also serving as a noticeable evolution of the design. The Sherpa is still a slimline, reponsive metal yoyo, but now with metal caps that give it a completely different look and feel from anything else on the market. The Sherpa ships responsive, but with an included longer axle and CT bearing for unresponsive play. 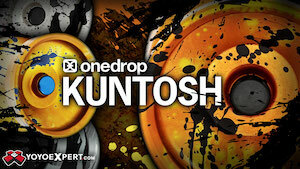 Plus, it’s a responsive yoyo with a fingerspin dimple. Get brave, y’all.